I am mostly sure that my dad does not read my blog but in the event I am wrong: Dad, if you are reading this please turn around now. Come back after June 16th. Thanks! Love you! Ahem. Sorry. Where was I? Oh yeah. So: Father's Day. Every year I struggle to know what to get my dad. Usually it ends up being something that defaults to his love of coffee (travel mug with photos) or his love of birds (birdhouse or bird feeder). This year I had an epiphany: Dad loves to fish. LOVES it. 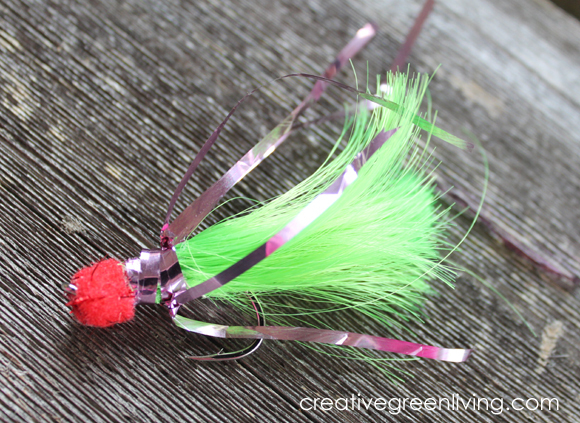 So I thought it would be appropriate to make him his own personalized fishing jigs. Please note: I have not actually taken these fishing yet. I don't know if they will actually catch anything but they seem well suited for clear water fishing (and fishing store guy said he thought they seem good for steelhead). They sure were fun to make, though, and I hope my dad likes them! 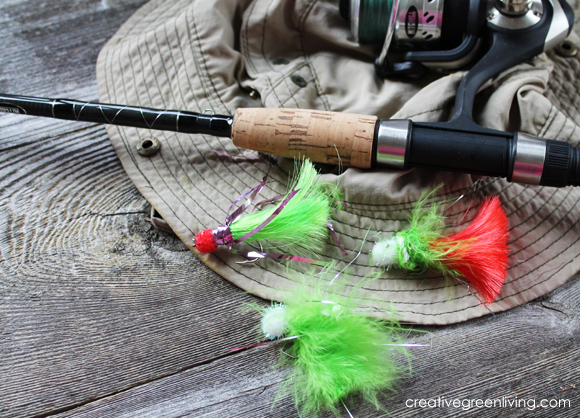 Learn more about jig fishing for steelhead or jig fishing for bass. All supplies except for the fishhooks were purchased at the dollar store. PLEASE NOTE: Fishhooks are very sharp and should not be handled by children. Adults should use pliers and tweezers when possible to hold and handle items being pierced by hooks to avoid accidentally hooking your own hand. 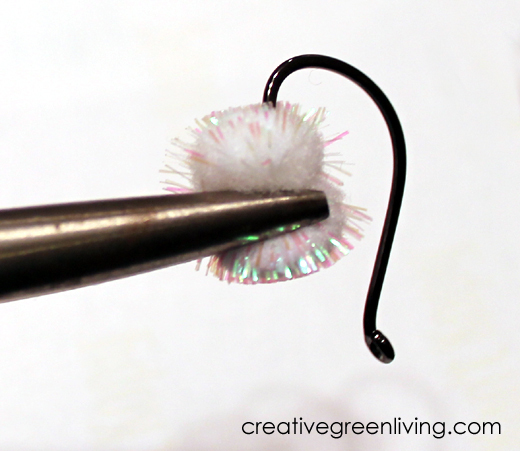 Skewer a small sparkle pom with a hook and slide it up near the eye. Alternately, you can also purchase Jig Head Hooks which are hooks that already have weighted heads at the top. Step 2: Add a skirt. I used both the feathers that I peeled off of the slap bracelet as well as a pig tail taken from the pig tail head band as a skirt. Just piece the material and slide it up the shank against the head. Use E-6000 glue to secure. Use scissors to trim ends. 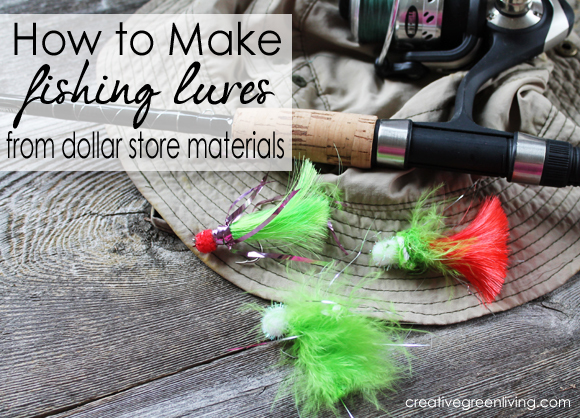 Jigs that catch the light attract fish attention. I added a little bit of extra bling to one of the jigs by wrapping it in metallic pink strips of gift wrap packing material. 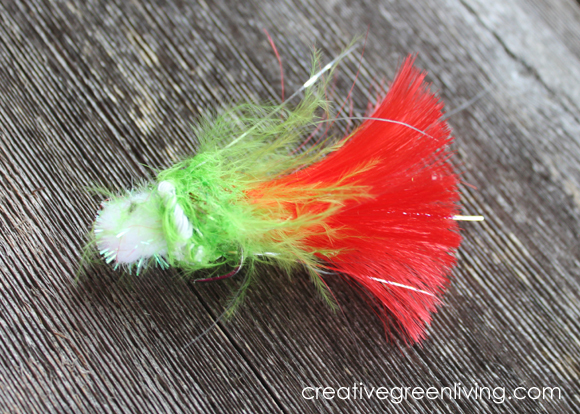 I added some of the green feathers with sparkle fiber to the top of the red skirted jig. 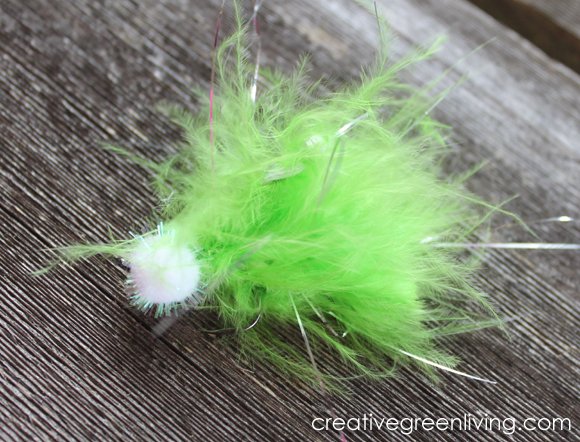 The green feather jig I left as it was since the feathers had sparkle in them already. What a wonderful handmade guy gift idea! Did it work to catch fish with them? Have you tried? I haven't taken them fishing yet. These are for my dad for father's day so we won' t be able to test them until then. I'll post an update here for sure if we catch anything! So cool! My neighbor loves to fish and this would be a great idea for him to "craft" this Summer. What a unique and cool idea Carissa! I would never have thought of this! Pinning! Thank you for giving the information. I have already created various types of lures for fishing which I am going to present to my father. My father likes to do fishing as he has a hobby in it. This steps will help me to create some more lures.